“Deep Space: Re-signifying Valle de los Caídos” Workshop is one of the activities and pop-up events, led by international artists and researchers, that has been organised over the entire duration of TRACES final exhibition “Contentious Objects/Ashamed Subjects”, curated by Suzana Milevska. Valle de los Caídos (Valley of the Fallen), the Francoist monument built between 1940 and 1959 close to Madrid, will soon be emptied of Franco’s remains. As it risks becoming a cenotaph—an empty burial monument—and it is at the centre of heated public discourses surrounding its future, Valle de los Caídos is paradigmatic of the difficult processes of re-signifying controversial monuments. 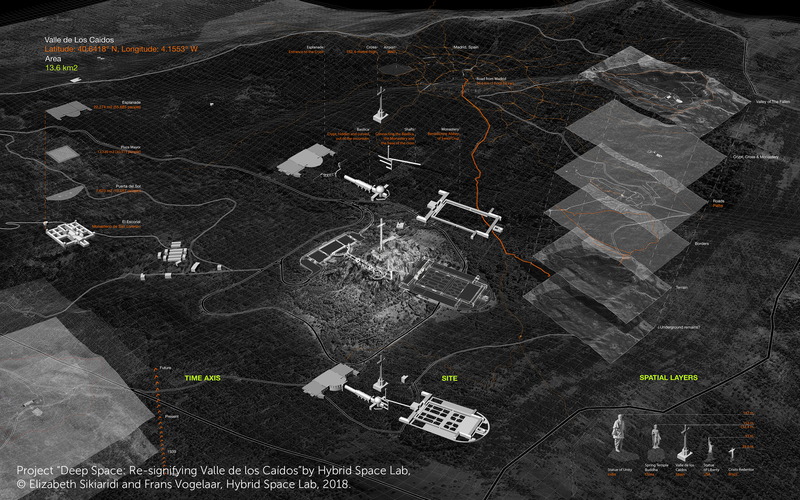 In October 2018, as part of the Deep Space independent artistic project and long-term investigative program, Hybrid Space Lab curated the international, interdisciplinary workshop “Deep Space: Re-signifying Valle de los Caídos” in Madrid. The reliance on artistic practices and applied disciplines transgressing the arts field, such as architecture and media studies, to approach controversial heritage interrogates how these disciplines and their interaction may contribute to the re-construction of memory, exploring the potential of integrating diverse methods to process historical wounds. By favouring artistic engagement with memory making, “Deep Space: Re-signifying Valle de los Caídos” aims at establishing a place for dialogue and proposals on possible future visual and sensual heritage landscapes in the Valley’s contentious spatial and affective context. The workshop’s special focus lay on networked digital and physical tools that allow transforming the site without physically touching it. These tools also enable the integration of side-lined voices within the vision of a polyphonic monument, counterbalancing the site’s totalitarian narrative, paving the way from recognition to reconciliation. The workshop kick-started the “Deep Space” exploration, focusing on how future heritage sites could look, feel, sound like, and how their digitally enriched features could affect memory-making processes. Elizabeth Sikiaridi and Frans Vogelaar are the founders of Hybrid Space Lab, a Berlin-based Think Tank and Design Lab. Hybrid Space Lab is a laboratory for cultural innovation, a cultural breeding ground for the development of groundbreaking concepts and for the promotion of innovations that contribute to positive changes in society and the environment. Since 1997 Prof. Elizabeth Sikiaridi has been teaching design at the Landscape Architecture Department of the University of Duisburg-Essen and the University of Applied Sciences Ostwestfalen-Lippe. She was born in London and grew up in Athens. She studied architecture at the École d’Architecture de Belleville in Paris and at the TU Darmstadt, worked in the architecture office Behnisch & Partner in Stuttgart and was an Assistant Professor at the TU Berlin. In 1998 Prof. Frans Vogelaar founded the first worldwide “Department of Hybrid Space” at the Academy of Media Arts Cologne. Frans was born in Holland and grew up in Zimbabwe and Holland. He studied industrial design at the Design Academy in Eindhoven and architecture at the Architectural Association School of Architecture, London, and worked in the Studio Alchymia in Milan and the Office for Metropolitan Architecture in Rotterdam. Both Elizabeth and Frans are lecturing broadly internationally, among other as Visiting Professors at the Politecnico di Milano.